As an older lady I consider myself fortunate to still be in the saddle, even more so to still be riding colts. When the action starts though, and riding a frisky three-year-old pretty much guarantees that, I’m reminded of Jack Nicholson’s line in the film The Bucket List “never trust a fart”- in this case it not only applies to the colt but to me as well! With age comes experience, these days I plan my rides. I put together a specific strategy as far as what I need to work on with my horse while I’m with him. Then, as I figure out which side of the stall my feller woke up on, I will adjust our plan. “My plan” turns into “our plan” pretty quickly. As there are two of us in this program and it’s not all about me. With young horses I’ve learned the hard way to be flexible, be different and to make it fun for both of us. Having made plenty of mistakes in the past, I’ll never again drill my youngster to the point of sourness and boredom. These days I throw as much good stuff at ‘em as I can. 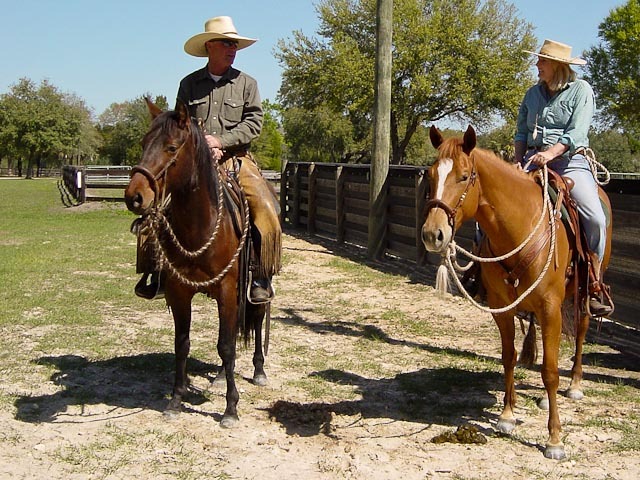 Trail riding through Florida’s pine forests and palmetto thickets, long-line work, ground driving and riding plenty of obstacles, circles, transitions and of course cows! In my opinion, every horse deserves cow work, whether it be penning, sorting or gathering. For the young horse especially, cow work is good for the mind. It helps young horses develop coordination which translates ultimately into three simple yet important moves; walk, stop and backup on a loose rein. I realize I’ve been a bit quiet this Spring, but that’s because my horses have kept me busy. My now four-year-old cutting mare; JR’s Blonde D, has been coming along nicely and is now ready for NCHA competition. The new project in the barn is a three-year-old cutting bred Quarter Horse gelding named “Rusty Can Do”. I like to take all of my colts over to the Parelli Center in Ocala. Watching our scores edge upward in the Savvy Challenges builds confidence in both of us. Overnight camping trips and riding turn-back for my fellow cutters in the practice arena really helps to put miles on a young horse without wearing them down. A highlight in April was a private lesson with clinician Martin Black. And boy, did I ask a million and one questions! The experience left me with a year’s worth of riding to work on. There’s nothing like no-bull honesty. When Martin opened up the back of his little tack trailer, the angels sang as bridle bits shined bright before my eyes; bosals begged to be touched and fine fuzzy mecates practically jumped between my thumb and my first finger. When I commented on how many bridle bits one really needed to have in one’s inventory and noted the related expense, Mr. Black was kind enough to ask me the question, “Just how many pairs of shoes do you have in your closet?” Point taken. It was a joy earlier this year when I helped a young lady keep her horse. Actually, I went to look at her mustang mare named “Roxie”, which she’d pretty much given up on, while I was on the hunt for my next project. A two hour drive to visit what turned out to be a stunning red roan mustang. I decided the relationship this lady had going with her sensitive mare was salvageable and someone just needed to tell her that; so I did. I told her she needed to stop tip-toeing around this mare and treat her like a started horse; tie her, saddle her and challenge her. The lady kept the mare, took her off the market and is now riding her fancy mare all the time; makes me smile every time I think of her and Roxie. In March I helped 70 young riders participate in the Stirrups-N-Strides therapeutic riding challenge and one of the horses packing those folks around was my first project horse from several years ago; Ivy. I can barely write about the depth of my feelings for this appaloosa gelding. The joy in his eyes when he saw me remains indescribable. He remembered his Spanish walk, how to park out and bow; all the tricks I taught him and without a pinned ear. Dearest God, I still love Ivy but he’s a natural as a therapy horse and has found a good home. My current project, “Rusty Can Do” is my latest acquisition. This dun gelding is impulsive, inquisitive, friendly and a handsome fellow with a pretty mane and a cute head. Extremely Forward is the descriptor for Rusty. I really need a “using horse” who’s adept at everything I want to do; there’s that “I” word again. Realistically as a team, we’ll meet somewhere in the middle and work it out but I’ve set our sights high. Rusty’s been a bit of an enigma since he arrived from his native Texas. His world was comprised of paddock, round pen, cutting arena and wash rack (in that order). While he’s completely unintimidated by 200 head of cattle coming at him head on, his legs shiver at the site of a blue tarp. The good news is that with feel, timing and a good amount of patience, we’re tackling life head on and having a grand time. On my recent 52nd birthday, I loaded up both horses and found some shady trails riding Blonde D and ponying Rusty. We kept an eye out for bear and deer but saw only tracks from the night before on the trail. Can life be any better? My horses give me life; literally. Without them, I would be lost. Most of my life I’ve battled depression, on and off and up and down through the years. When I was a teenager, a lovely palomino gelding named “Heine” saved my life. In my native New England, we rode through antique covered bridges and across the gurgling creeks beneath. He saved me countless times from myself. He was my first true love and somehow, I believe he knew that. So today, as I spend my healing time with the young Rusty Can Do and talented Blonde D, I believe they know, too, that they join me at a time in my life when I most need a horse with a pretty mane and a bright eye. Without horses in my life, I’m nothing. So bring on the farts, even though they can’t be trusted, I’ll ride anyway. 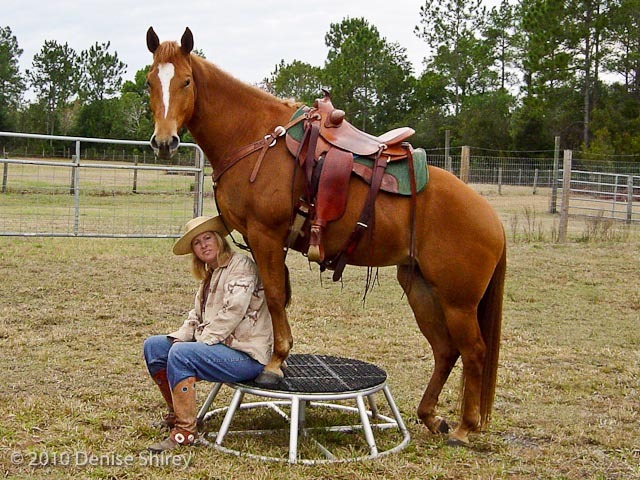 Denise Shirey enjoys cutting horses, obstacle challenge competitions and heading out on long trail rides. Sheʼs always on the lookout for her next two-year-old prospect. When not horseback, she makes a living in the defense industry. Miss Denise is a regular contributor to High Minded Horseman. Comments for "Over Fifty and Still in the Saddle"
Lori on June 02, 2011 Great article ……. having a relationship with a young horse… I always found difficult to accurately describe to people until the movie Avatar! Because that’s it a total mental and physical connection with the animal and you truly are one mind! To good horses, good friends and great rides!!! Best Therapy Ever!!! Always riding my Avatar! Jessica on June 02, 2011 Hi Denise! Thank you for supporting and encouraging my journey with Roxie. Your visit was inspiring and very helpful. She is going great in her hackamore and loves cows. Hopefully we’ll see you at the Parelli center or Rendezvous this October. Sandy F. on August 14, 2011 Still in the saddle – well where else would we be ?